The Ferrari 246 GT Dino was a mid-engine rear drive sports car manufactured between 1968 to 1976, and was an attempt by the Ferrari company to introduce to the market relatively low cost sports cars to consumers by means of recycling and salvaging working components of other cars. By salvaging such components, rather than creating them from scratch, the theory was that major savings in production costs could be made and these savings could then be passed onto the consumer with the final product. This posed something of a dilemma for the Ferrari company, they wanted to try to break into and reach new markets and new consumers by offering them a product that was both affordable and prestigious at the same time. However, in so doing so, the company did not want to alienate its existing customer base who had paid good money for the privilege of owning a luxury car and Enzo did not want to cheapen and devalue the Ferrari brand by offering supposedly “inferior” goods. The compromise of the Dino brand was reached as a face saving, happy medium. The Dino series was also unique in that it was a break away from the traditional 12 cylinder engines of the Ferrari cars, as it would only make use of 6 cylinders. This was brought about in a bid to increase customer safety, and the Dino series derived its name from the deceased son of Enzo Ferrari, Enzo had named the car after his son in memory of him. The car was reaching out to new consumers and enjoying a great deal of critical acclaim not just because of its lower pricing, but also because of its rather innovative design which sought to utilise a mid engine design a previously unprecedented idea. A mid engine design was the norm within the racing world, but was not even considered mainstream within the average consumer car, most likely to the fact that the benefits of such a design were marginal indeed and strictly aesthetic. The mid engine design allowed for a more elegant hood of the car, but compromised both the safety of the vehicle (the car was more awkward and ungainly in terms of steering) as well as the relative comfort for the passengers, as the car became more cramped. This was a factor for the introduction of the 6 cylinder engine, as a bid to compensate for the weaker steering and handling of the vehicle. Whilst the Dino series was widely and critically acclaimed, enjoying a great deal of success, it always seemed to be something of a point of contention for the Ferrari company. After the 206S first debuted in 1965 at the Paris Salon, the Dino 206S did not actually receive any official endorsement by the Ferrari company, this was demonstrated by the somewhat conspicuous absence of the companies logo. 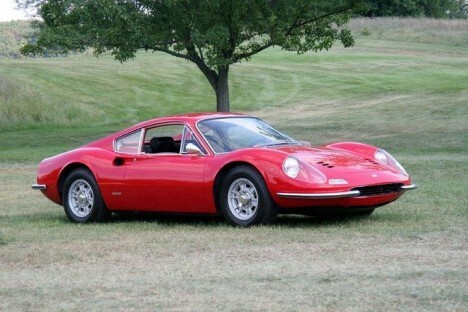 Therefore, the Dino 206S was sold as a separate product and was never really a Ferrari product, despite the connection. The Dino was also created to act as a potential contender to the Porsche 911, but this was a task of Herculean proportions, In order to meet the Formula Two racing regulations, over 500 production units had to be made, a figure that Ferrari simply could not possibly attain under any circumstances by itself. In 1973 the Dino 308 Gt4 was produced until 1980 and had the somewhat dubious honour of being the only Dino model to actually receive the official Ferrari logo, and was totally at odds with the original 206 and 246 of which it was originally conceived.